Simply put, hyperhidrosis is excessive sweating. The sweat glands secrete abnormally large amounts of perspiration; much more than what is necessary to cool the body. It can affect any part of the body, but the feet, hands, armpits and groin are most affected, simply because there are more sweat glands in those locations. Other than excessive sweating, the problem is often accompanied by psychological symptoms, such as anxiety and/or depression. Dehydration can easily occur, because of the excessive fluid loss. So, thirst is another symptom that many people experience. Intolerance to cold temperatures is not unusual, as the sweating chills the body, particularly the hands and feet. Unpleasant body odor may be present and the condition is sometimes accompanied by redness of the face (blushing, rosacea) or chest. The underlying cause of primary hyperhidrosis is unknown, although genetics are probably involved, as 30-50% of patients have a family member with the same problem. The term “primary” is used to differentiate from hyperhidrosis that is a symptom of another problem. Dozens of different diseases, neuropathies and injuries can cause excessive sweating. Anxiety disorders and phobias can cause it. Low blood pressure, thyroid problems, menopause, prescription drugs, Parkinson’s and heavy metal poisoning are all possibilities. Nicotine, caffeine and spicy foods can trigger a response. People with type II diabetes typically experience excessive sweating. Special foot care advice is available for diabetics. In the primary condition, not one that is caused by another problem, the recommended treatments depend on the severity of the condition. In some cases, antiperspirant with high aluminum chloride content is all that is necessary. Every effort should be made to keep the feet dry, because a moist environment increases the risk of athlete’s foot and other fungal infections. In some cases, the toenails become infected, with the result being yellow, thick, unattractive brittle nails. So, here are some suggestions for keeping your feet dry, all year round. Wicking wear was originally developed for diapers. 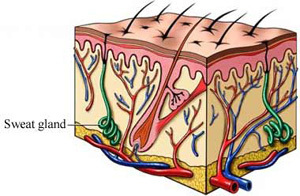 It pulls moisture away from the skin, to the outside of the material, where it quickly evaporates. Wick Dry Socks are available at FootSmart.com in a variety of sizes and colors. All of the alternatives mentioned here are safe and inexpensive. They can help you stay comfortable, keep hyperhidrosis under control and reduce your risk of fungal infections.